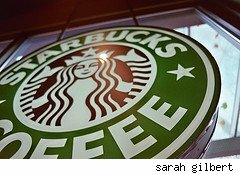 In the second legal challenge to a Starbucks store's fair treatment last week, a Florida man is suing the Starbucks on Powerline Road west of Boca Raton. Robert Friedman suffers from Tourette's syndrome, a genetic disorder which is characterized by uncontrollable outbursts, often laced with obscenities. Last year, he was visiting the Starbucks and suffered from such a flare-up; customers said he banged on the wall and shouted curse words. Although Friedman says he later apologized for the eruption, the employees called the local sheriff's office, asking deputies to remove him from the premises and give him a "no trespass" warning. Tourette's syndrome is far more common than most people realize; between 0.1% and 1% of children have Tourette's, although most suffer from chiefly the physical and less socially unacceptable verbal tics (which can include coughing, throat clearing and eye blinking) and not the more shocking or noticeably odd tics such as coprolalia (the spontaneous utterance of socially objectionable or taboo words or phrases), echolalia (repeating the words of others) and palilalia (repeating one's own words). In most people, however, symptoms decrease and eventually disappear by adolescence. But for those who suffer from severe symptoms through adulthood, there is no cure and no medication that works universally well for all sufferers. While the severe form of Tourette's syndrome can be a challenge, it is a protected disability under the Americans with Disabilities Act and the Florida Commission on Human Relations "found that there was evidence that the coffee shop didn't take steps to make accommodations for Friedman's disability." Lawsuits brought by individuals with Tourette's have had mixed success; cases that have achieved success include one against Wal-Mart and another against a hair salon. However, in most cases, the defendant has not paid damages to the disabled person, instead agreeing to provide training to its employees and accommodation to disabled customers. In a few instances, a company has paid damages into a Tourette's syndrome foundation. Given the support of the Florida Commission on Human Relations, Friedman will likely have a case here, just as the barista who says he was fired for his tattoos (while female employees with tattoos were not) likely has a case as well. Starbucks, unsurprisingly, isn't commenting on either legal matter; I'd be willing to bet, though, that someone in the corporate human resources department is seriously evaluating the company's training manuals and preparing for an uncomfortable year. Update: Reading the filings for the case reveals that all the baristas at this coffee shop knew Friedman, and knew of his condition; he was a regular customer and generally welcomed. The case hinges on the extreme action of asking the sheriff's deputies to bar him using a "no trespass" warning. He apologized after the outburst, he says, and the baristas went forward with the removal anyway.